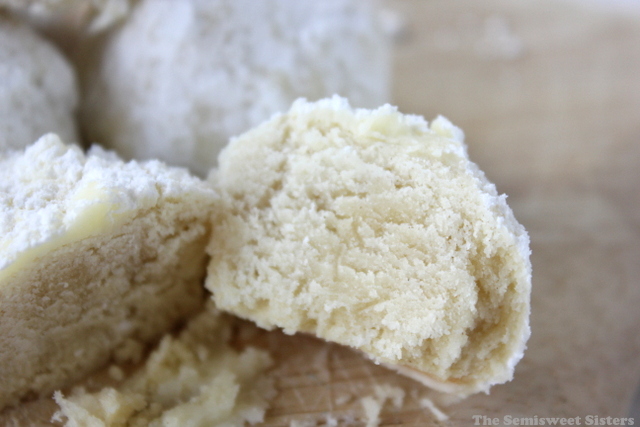 I love Snowball Cookies, they look so appealing with all that fluffy powdered sugar coating. However, I don’t like nuts in my baked goods plus there are several people in my family with nut allergies so I wanted to make these with no nuts added. I didn’t know if it was possible but after looking at the recipe I noticed that it’s just a basic shortbread cookie with nuts in it. I omitted the nuts & it turned out just fine. 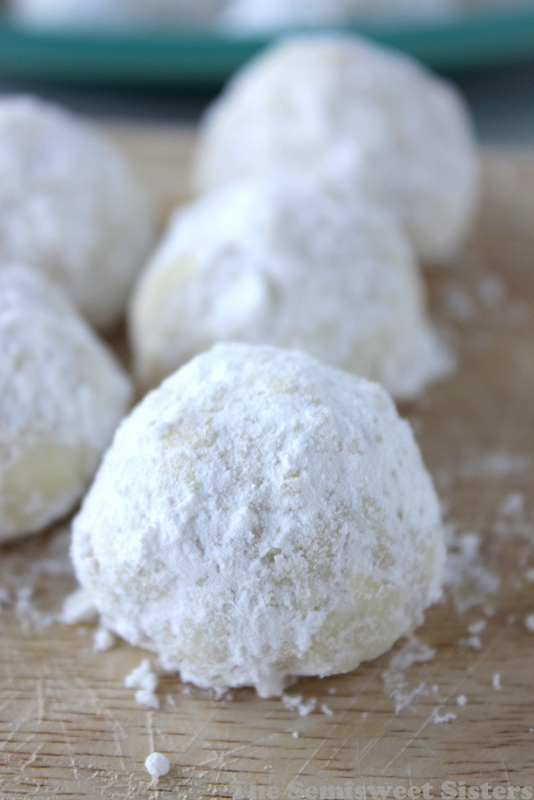 If you still want to make Snowball Cookies with nuts just add 3/4 cup nuts to the recipe & you can have traditional Snowball Cookies still. 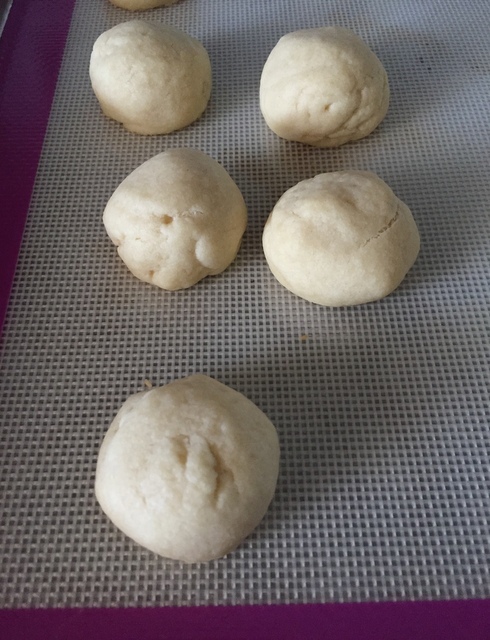 You Roll the dough into 1″ balls. I used a non stick baking mat because it helps to keep the cookies from spreading out when they bake but its not required. You don’t want to over bake the cookies, take them out when they are set, the bottoms will be a light golden color. Mine were done in 9 minutes. Using a large mixing bowl, mix butter & powdered sugar together. Add in vanilla extract. Add flour & mix until soft dough ball forms. 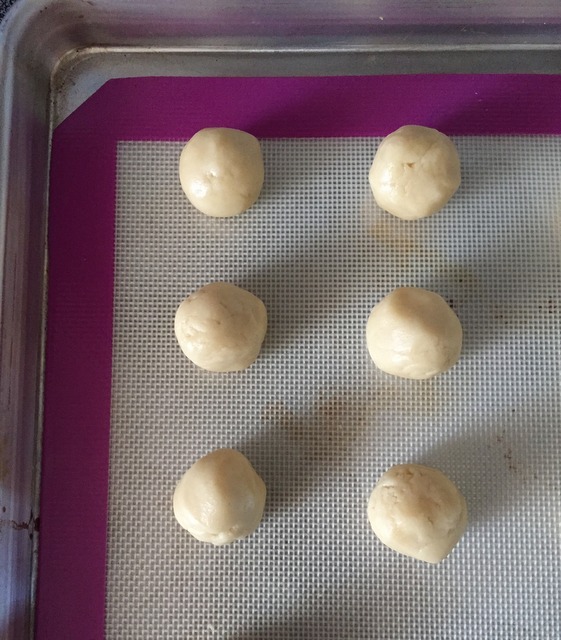 Roll dough into 1" balls & place on ungreased cookie sheet (I used a nonstick baking mat). Bake for 8-10 minutes or until cookies are set but not browning. Remove from oven, let cool for a few minutes then roll in a bowl of powdered sugar. Place on cooling rack to cool, then roll in powdered sugar again. Most holiday seasons Tollhouse makes a special Christmas chocolate chip bag. I love adding those to these cookies so they still have some different texture, but look super festive. Hope I get a chance to try this recipe! Stacy, adding chocolate chips is a great idea. I know my sister would love that, she adds chocolate chips to everything! If you try the recipe let us know how you liked it! Merry Christmas! Just made these yesterday and they came out perfect! I browned my bottoms a little too much, but that’s my fault :) I added the almonds, and I don’t think they’re going to make it to bringing them somewhere on Christmas. Luckily they are super easy, so I might make a second batch. Thank you! Hi Crista, Sorry to hear the bottoms got too browned. It’s hard to tell when they are done. Good luck if you make another batch! Have a Merry Christmas! I just discovered these cookies and I love them. I added grated lemon zest and a touch of lemon juice and they were so good. Thank you! Hi Elisabeth, So glad you liked the recipe. Adding lemon sounds delicious! How much grated lemon zest & lemon juice did you use? 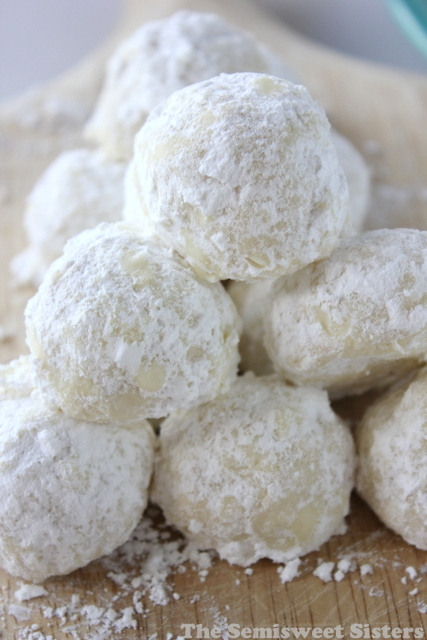 Hi Dulce, I didn’t add lemon to these but it is recommended that you add 1 teaspoon lemon juice & 2 teaspoons lemon zest if you want lemon snowball cookies. It seemed to be pretty dry while mixing it. Like it needed more liquid? Hi Renee, I’ve been hearing from some people that the dough is too wet & from others that it is too dry. I think it may be the way each person measures their flour or perhaps the brand they use. If dough is too crumbly I would try adding an extra tablespoon of butter to dough and see if that helps. How many cookies does 1 batch make? How far in advance can you made the dough? Hi Norma, You could make the cookie dough a day ahead of time, any longer then that and I would freeze the dough. Mine just melted, what did i do wrong? Hi Beatrice, I’m not sure why they melted, you could try placing the balls of dough in the refrigerator for 30 minutes before baking. Hi Sue, Margarine usually works as a good substitute for butter but I have not personally tried it with this recipe. Please use real butter, so worth it. I never buy margarine for anything, ever, my bake goods are 2die4 and it is the good ingredients I use..
Hi Molly, I agree, butter is a must for this recipe. Thanks for taking the time to comment, we appreciate it! I need help! I baked them just fine, but when I rold them in the powdered sugar, they start falling apart. Any suggestions? Hi Leah, Oh no I am sorry to hear they started falling apart when you were trying to coat them in powdered sugar. I’m not sure what the problem could be, I always roll them while they are still warm & they turn out just fine. Maybe the batter had a little too much flour, it sounds like they might have been a bit dry if they were cracking apart or they might have been too cool. You could try placing them in a bowl of powdered sugar & spooning the powdered sugar over them gently and see if that works. Thank you, Katie! You are so sweet to answer so quickly! :) My friend was able to do them (she must have a lighter hand :)), so maybe I was being too rough with them or not allowing them to cool enough…thank you again! How long are the cookies good for? Can I make them a few days in advance to bring to a family event and will they still taste fresh? Hi Megan, Yes, these cookies can be made a few days ahead of time. I usual eat them within a week but I think they can last up to one month in an airtight container.